Since the recent announcement of the inaugural MCM50K, event organizers have received approval for a revised course that has resulted in multiple favorable upgrades. The course will no longer start on the National Mall as had been previously planned. 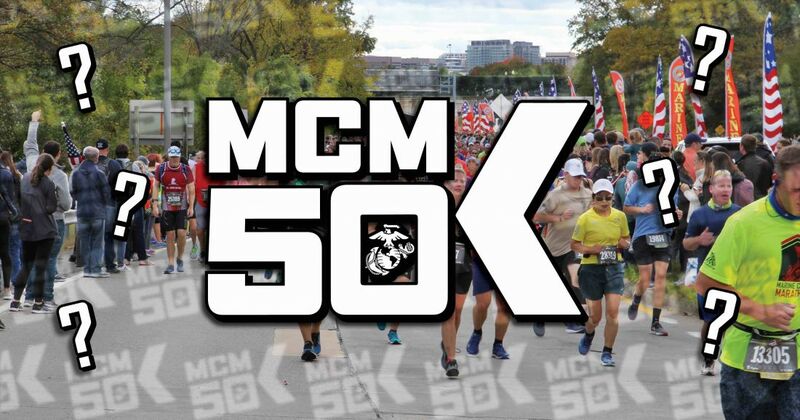 Instead, the MCM50K will begin at the same start line as the Marine Corps Marathon in Arlington, VA on Route 110. The MCM50K will launch at 7:30 a.m., 15 minutes prior to the wheelchair and handcycle participants and 25 minutes before the start of the 44th MCM. The course will diverge from the MCM course at mile 4.5 on the DC side of the Key Bridge as 50K runners will run an out-and-back along Canal Road. Returning to the MCM course along M Street near Mile 10, the 50K participants will merge with the MCM field at the MCM's mile 4.5 and fall in with runners matching their approximate pace. These changes allow for an increase to the maximum required pace to 12:30 minutes per mile. Additionally, the new course will be capable of handling an expanded field of participants. Registration for the inaugural MCM50K will now be available for up to 1,700 participants. Online registration opens on Wednesday, February 27 at noon. Following the announcement of the event, more than 400 comments and questions were posted on the MCM Facebook account. Here are answers to some of the more frequently posted registration-related questions. Are wheelchairs and handcycles able to participate in the MCM50K? The MCM50K course will not support any wheel devices including duos, wheelchairs and handcycles. Are entries set aside for military like the MCM? The early Active Duty/Reserve registration program is exclusive to the MCM and will not be available for the MCM50K. Can an MCM entry deferred from 2018 be used to register for the MCM50K? Deferments from the MCM only convey to the following year's MCM and not the new 50K. Does finishing the MCM50K count towards MCM Runners Club eligibility? A finish in the MCM50K will count toward the total tally of a runner's MCM finishes either in determining eligibility for membership in the MCM Runners Club or adding to the existing record of a member. Will the 50K require an extended finish time for the MCM? The MCM50K will begin at 7:30 a.m. and conclude when the course closes at 3 p.m. Runners must maintain a 12:30 pace per mile throughout the course. Will the MCM50K medal be the same as the MCM? The MCM50K shares the finish line with the MCM at the Marine Corps War Memorial. Marine lieutenants will present a special and unique medal to the 50K finishers. The medal will pay tribute to Marine Corps images and icons, just as the MCM medal has for over four decades. Can runners use the 17.75K Access Granted to secure a spot in the 50K? Marine Corps 17.75K finishers can only earn access to the MCM. The Marine Corps 17.75K will happen on March 23.